Afghan security forces stand guard after an attack on the American University of Afghanistan in Kabul, Afghanistan, Aug. 25, 2016. 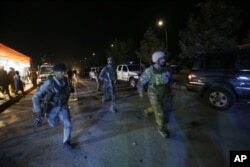 Afghan police say at least 13 people are dead and more than 45 wounded after a nearly 10-hour long attack on the American University of Afghanistan in Kabul ended Thursday. Among the dead - seven students, three police officers, two university security guards, and a guard from a nearby school for the blind, Kabul Police Chief Abdul Rahman Rahimi told VOA's Afghan service. He said 36 students and university staff were among the injured. More than 700 staff and students were rescued after being trapped inside the university complex, he added. Afghan security forces rush to respond to a complex Taliban attack on the campus of the American University in Kabul, Aug. 24, 2016. The attack began with an explosion around 6:30 p.m. Wednesday local time and set off about an hour of gunfire as security forces responded. Officials described the assault as a "complex attack." Police officials said at least two attackers had been killed. One student trapped on campus told the Reuters news agency by phone that he was holed up inside a classroom with some other people. He said they were hearing bursts of gunfire outside. A student who escaped, Massoud Hossaini, told the Associated Press that he, too, had been trapped with some other students in a classroom, where they barricaded themselves inside by pushing chairs and desks against the door. He said they eventually managed to escape through the university's northern emergency gate. Another student, Roman Dehsabzwal, told Radio Free Afghanistan that he was in a classroom when everyone heard a loud bang and the windows shattered. He said he and two other students jumped from a second floor window to escape. A Pentagon spokesman tells VOA that a small number of U.S. advisers assisted their Afghan counterparts in dealing with the attack. Danish journalist Sune Rasmussen spoke to VOA from outside the university. He said some people managed to escape through a wall damaged by an explosion. There are no claims of responsibility from militant groups. The U.S. State Department condemned the violence and called it an "attack on the future of Afghanistan." Earlier this month, an American professor and his Australian colleague were kidnapped at the school. No group claimed responsibility for the kidnapping and the professors' whereabouts remains unknown. The university was built with support from the United States. It opened its doors in 2006. The university is independent, but based on the U.S. model for liberal arts education.